Kreider, a Harvard-trained professor emeritus at Anabaptist Mennonite Biblical Seminary, has spent much his career studying early Christianity. In The Patient Ferment of the Early Church, he draws together this lifetime of work into a readable yet detailed study the early Church’s growth, looking especially at the period before Constantine’s reign (p.4). Kreider is by no means the first person to dwell on this topic. He is in conversation both with the stimulating works of people like Michael Green who emphasize the “clash of ideas” brought about by the presence of Christianity in the Greco-Roman world as well as the writings of those like Ramsay MacMullen who focus more on sociological/cultural factors (p.1). Kreider’s study is wide-ranging, digging into Christian sources ranging from the homilies of Origen to the Syrian church order known to us as the Didascalia apostolorum (The Teachings of the Apostles), but he concentrates especially on the works of a series of North African writers: Tertullian, Cyprian, and finally Augustine. Bourdieu contends that the knowledge that truly forms us is more profoundly a part of us than our intellectual knowledge. It is “corporeal knowledge,” a “system of dispositions” that we carry in our bodies. Habitus is reinforced by story, the little stories of our family and community as well as the big stories that undergird our culture… Above all, habitus is formed by repetition, by the sheer physicality of doing things over and over so that they become habitual, reflexive, and borne in our bodies. (pp.39-40). Thus, Kreider argues that for most early Christians, cultivating a patient habitus entailed a deliberate transformation of character. He notes that the early Church Father Irenaeus “insisted that the church’s overarching goal was ‘renewing [people] from their old habits into the newness of Christ” (p.157). Kreider goes on to observe that communities in the early Church relied especially on catechesis (spiritual formation and theological instruction carried out in preparation for baptism) and worship, centering especially on prayer and the celebration of communion, to shape the habitus of its members (p.2). Following baptism, Kreider argues that the patient habitus of early believers was built up through worship practices (p.184). Sermons, prayers, and the celebration of Eucharist all gave shape to the worship lives of many early Christians. These activities “formed the character of the Christians, aligning them with God’s purposes and habituation them to the surprising ways of Christ’s church” (p.184). Augustine of Hippo, the “ecclesiastical lion” who wrote his little-known treatise On Patience in 417 AD, stands at the end of the formidable tradition of patience in early North African Christianity. In Kreider’s understanding, the vision of patience advocated by Augustine was “novel” to the ongoing life of the Church, and it “justified a missional revolution that was taking place” (p.280). In On Patience, Augustine is similar to his North African predecessors in that he understands patience to be a key attribute of God and citing numerous biblical examples of patience. Thus, Kreider’s views Augustine’s work as rationalizing a new understanding of patience that ended up helping justify the more violent measures that would be repeatedly used against heretics and other enemies of the Church during the future centuries of Christendom (p.295). 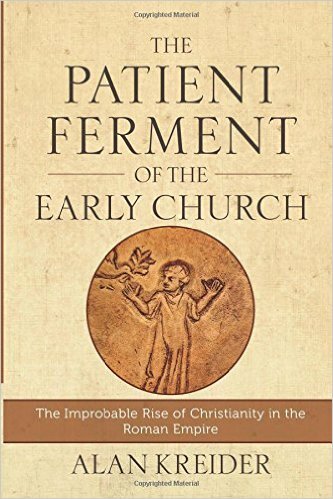 Alan Kreider’s The Patient Ferment of the Early Church makes a beneficial contribution to the subject of growth in the early Church, especially by paying sustained attention to the ways in which the beliefs and practices of early Christians were integrated into an overarching view of life: patient words and patient actions must go together. Near the end of Eugene Peterson’s masterful book on spiritual theology, Christ Plays in Ten Thousand Places, he strikes a similar note when he writes that, “Impatience is antithetical to a congruent life… Formation of spirit, cultivation of soul, realizing a lived congruence between the way and the truth—all this is slow work requiring endless patience” (p.337). I think that readers find in Kreider’s work rich soil for recovering the historical heritage of Christians throughout history who have (all too rarely) tried to make patience central for both spiritual formation and missions in the world. Even in the midst of Kreider’s exploration of Tertullian, Cyprian, and Augustine, there were a few moments when I would have been keen to learn more about how patience was understood by many of the Eastern Church Fathers during this time period. Maybe subsequent studies can help fill out this desire of mine. Also, I sometimes wondered how much the lives of early Christians measured up to their ideal visions of patience. While Kreider does at times acknowledge the presence of hypocrisy in the early Church, I at times wondered if some readers will get an unrealistic impression of an idyllic pre-Constantinian Church that was free from hypocrisy and strife. Don’t dwell on those minor critiques though. Kreider’s hypothesis is interesting, and his efforts have resulted in a stimulating, refreshing, and challenging read. By looking into a side of the early Church’s life that is all-too-rarely given significant attention, The Patient Ferment of the Early Church just might help some contemporary Christian communities to spend less time worrying about growth strategies and more time working to become deeply formed spiritually so that their words and deeds can flow together into an inviting testimony of Christ’s presence to those around them. This entry was posted in Book Reviews and tagged Alan Kreider, Augustine, Book Reviews, Church Growth, Cyprian, Early Church, Eugene Peterson, Habitus, Patience, Spiritual Formation, Tertullian, theology by joecrow91. Bookmark the permalink.